First up, the tier three battlecruisers appear to have been a real hit. 3,541 different characters produced a total of 47,023 of them as of 12:00am on Wednesday 7th December. The Tornado was the most built, with 16,292 followed by the Oracle with 10,630. The largest single producing character produced 537 tier 3 battlecruisers and the largest producing corporation 664. That’s a lot of battlecruisers to blow up. 9,258 Customs office gantries had been built by 1,327 different characters. One corporation built 310 of them, with the maximum produced by a single character being 150. 5,146 Customs Offices had been destroyed, leaving that many planets open to player control. Of these, 18 were player owned customs offices and the rest Interbus. Of the 5,128 Interbus Customs Offices destroyed, 778 were in low sec, 2,298 in null sec and 2,052 in wormhole space. These have been replaced by 4,515 player owned customs offices which were deployed at planets as of midnight. The largest single owner corporation held 51 customs offices. 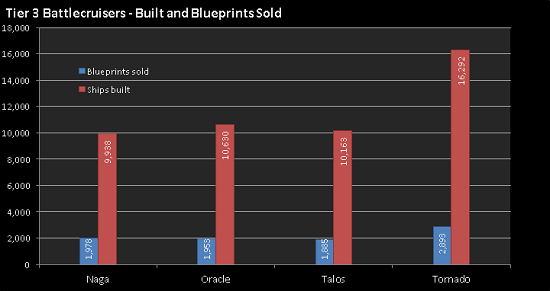 A huge amount of money was spent on the tier 3 blueprints; more than 4 trillion ISK. 4,138,410,333,998 ISK to be precise. That’s 8,709 blueprints. How much ISK is 4 trillion ISK? A lot. You’d have to kill Zor eight milliontimes to make 4 trillion ISK. ...Or a an increase of 37.31%! The average daily peak concurrent user count also jumped considerably, going from from 38,574 the week before Crucible to 43,180 the week after. We hope you’re all still enjoying the expansion and don’t forget that CCP Soundwave still wants you to tell him about all the little things that you’d like to see changed in this forum thread. If you enjoyed my previous blog about PVP stats, don’t forget to take a look at it's comments thread where I’ve posted many further stats over the last week.